The perimeter of this bocce court is made of redwood, steel and gravel. 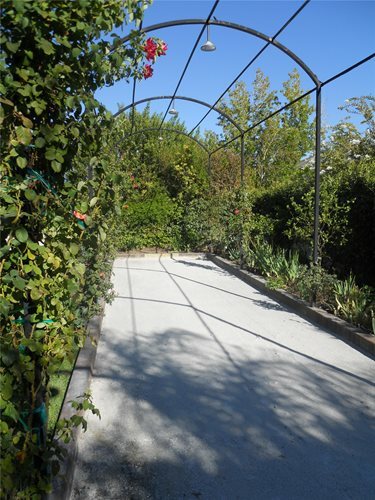 This bocce court has a nearby pergola so that spectators can rest in the shade. Once vines cover this arbor, the bocce ball court will be well shaded. 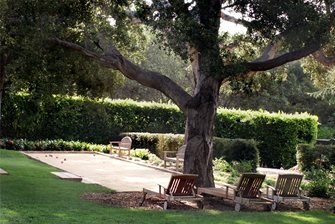 Chaise lounges and garden benches were placed near this bocce court to provide seating for spectators. 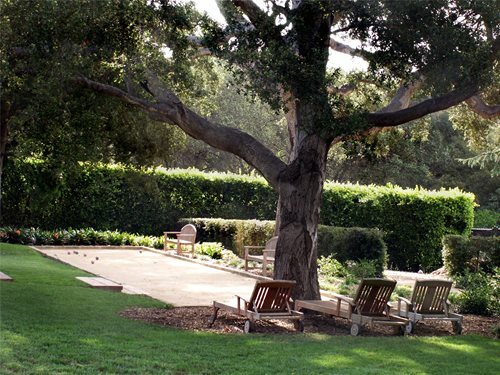 This bocce court makes good use of a long and narrow side yard. 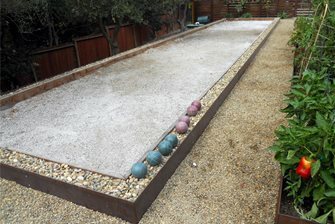 The surface of a bocce court can be covered with sand, decomposed granite, or crushed oyster shells. Get tips for court design, shade, sizing, and more. 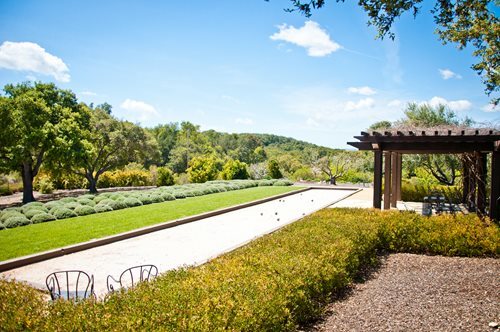 Tour a property where a professional landscape architect installed a large bocce ball court. The popularity of this old world Italian game is making a comeback in a big way. 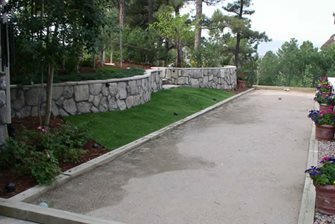 The long and narrow court surface should consist of a material that provides minimal bounce, such as decomposed granite, sand, or crushed oyster shell, none of which require any water. 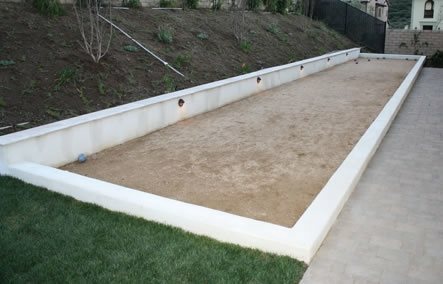 The standard size of a bocce ball court is 90 feet by 13 feet. However, you may construct one that is as short as 60 feet depending on how serious you take your Bocce. Proper drainage is critical to avoid water pooling in the court. Install French drains below ground using perforated pipe, a canvas sleeve and crushed gravel. Construct the perimeter game walls 6-18 inches high using rail ties, block or cast concrete curbing to keep the balls on the playing field. 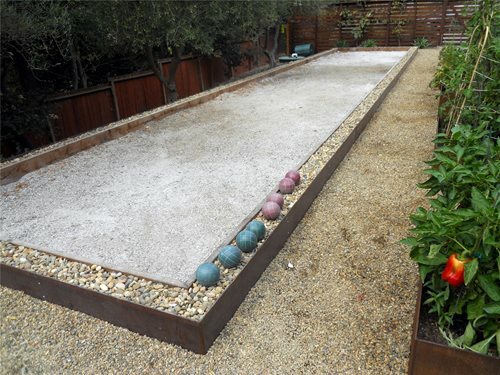 Because of its long, thin nature a bocce court is well suited to side yards. Another good place for a bocce court is along a fence or wall. Shaded Bocce CourtDesigned by Scott Cohen, the bocce ball court in the first video provides family fun while reducing water use by making the lawn smaller. Cast concrete curbs colored with acid stains were selected to frame the court. 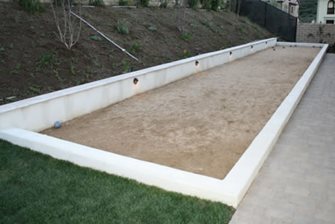 Rounded impressions in the concrete provide a place to set the bocce balls when no one is playing. Crushed oyster shell, the authentic Italian option, was used for this court. The warmth of direct sunlight was a problem, so in an effort to make the court usable during the day an iron arbor with climbing roses was constructed for shade. A Score Tower was then attached to one of the legs of the arbor, so that there would never be any confusion over who was the winner. Side Yard Bocce CourtDesigned by Joseph Huettl, the bocce ball court in the second video makes great use of a side yard. The court is slightly smaller than regulation size. Adapting the size of the court to fit your needs is more than okay. Ground oyster shells were used for the courts surface. The most unique part of this project is the design of the court's perimeter. A basic redwood bumper was installed with a strip of rusted steel about six inches outside the bumper. 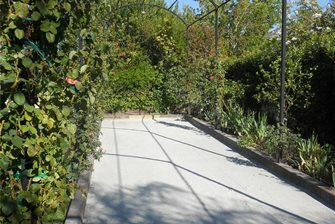 The space between the redwood and steel was filled with gravel, providing a unique court border and a place to set the bocce balls when not playing. 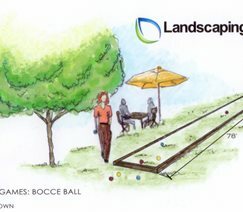 How to Play Bocce BallLearn how to play and score a game of bocce ball by visiting this Rules of Bocce web page.